Apple released iOS 9.2 today, bringing a host of bug fixes, improvements to system apps, and optimizations to Safari View Controller, the system's new unified web view based on Safari. 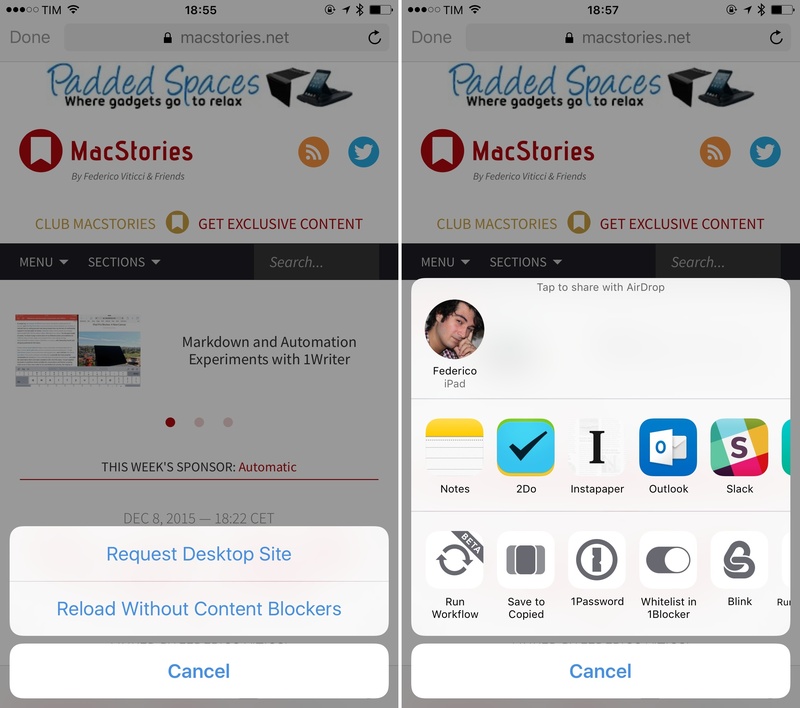 Introduced in iOS 9, Safari View Controller enables third-party apps to implement a native web view that presents webpages with the same engine and interface of Safari, accessing features such as iCloud Keychain and auto-fill. In iOS 9.2, apps updated for the new OS will be able to implement a swipe gesture from the left edge of the screen to dismiss Safari View Controller (a feature that had already been done in a custom fashion by apps like Tweetbot) – a more comfortable way of dismissing it than tapping a 'Done' button at the top of the screen. Also new in iOS 9.2, Safari View Controller's refresh button can be long-tapped to reveal additional reload options (just like in Safari) and action extensions can be used without issues on the currently open webpage. This will allow extensions such as 1Password and Workflow to run in Safari View Controller, which wasn't possible before. Among other improvements in today's release, Apple lists minor but welcome changes to Apple Music (create a playlist when sharing a song, new download indicators for offline songs), a new Top Stories section in Apple News, the ability to 3D Touch in iBooks to peek and pop pages from the Table of Contents, and Mail Drop support in Mail for large attachments. iOS 9.2 is available now via Apple's Software Update.